Looking for a new way to enjoy caprese salad? 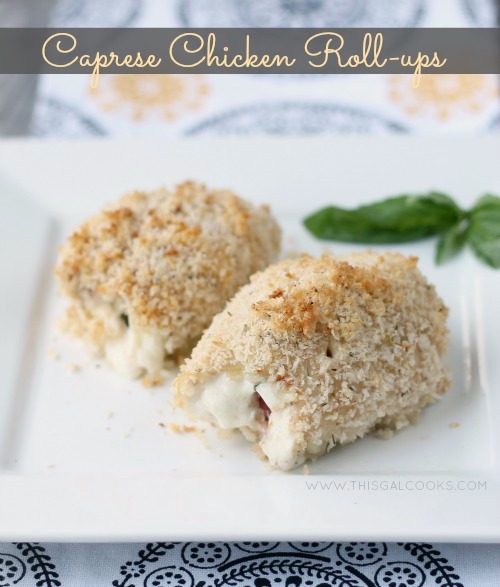 Try these Caprese Chicken Roll Ups! 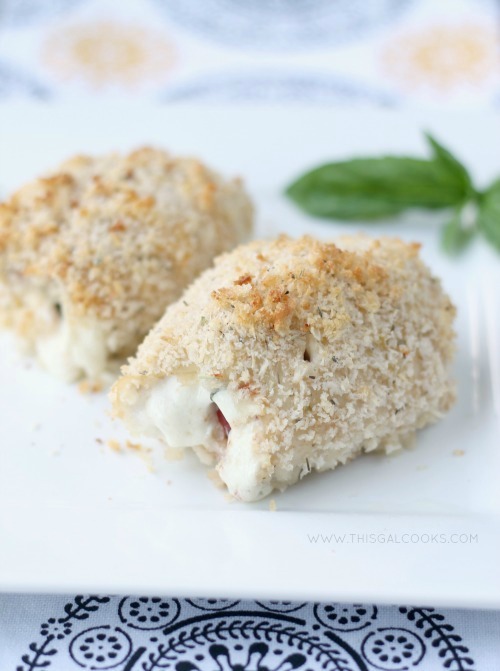 You get all the fun of a caprese salad stuffed into chicken breast! So I’m pretty much on a vegetarian kick right now but I still do like to eat meat. I think I had meat overload when we were in the Keys, though. I ate two hamburgers last week. TWO. I usually only eat red meat maybe two times a month. This week I’m eating mostly vegetarian dishes and maybe a couple of chicken dishes. The chicken dish I am sharing with you today would be perfect in my meal plan. Although, I would have to leave out the cheese since I am now going (mostly) dairy free. I made this recipe before I went dairy free so I was able to enjoy it with the cheese. And if you eat dairy, you can too! But if you don’t, just add more tomatoes, basil and maybe some spinach or red pepper. Those would be wonderful additions. 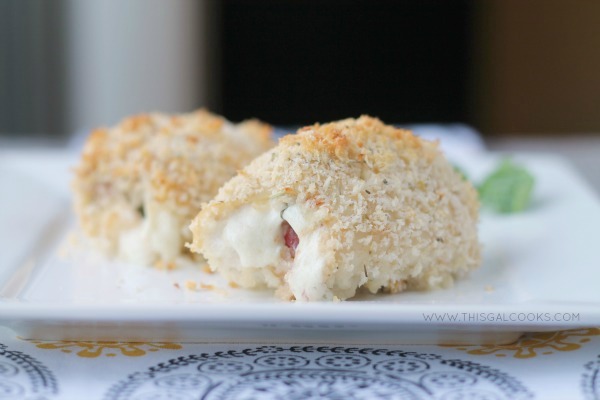 The idea for this Caprese Chicken Roll Ups recipe came to me one night while I was eating dinner. I was eating a caprese salad. Surprise. I wonder what could have caused me to think of this idea for dinner? My idea worked out pretty well. Not only did I have all of the ingredients on hand, it was easy to make and it tasted delicious. I hope you enjoy this recipe! In a small bowl or measuring jar, combine the tomato, onion, garlic and balsamic vinegar. Mis well. In a bowl, combine the panko, Italian seasoning and seasoned salt. Place the chicken breasts in between two pieces of plastic wrap and pound them until they are a little flatter than they already are. Season the chicken with the pepper and kosher salt. Place the mozzarella, basil, and then tomato mixture on top of each chicken breast. Roll carefully and then secure with a toothpick. Carefully dip the rolled chicken breasts in the egg and then roll it in the panko mixture. Place the chicken breasts in a baking dish or in a roasting pan on top of the wire rack, if you have one. Bake at 350 for 20-30 minutes or until the chicken reaches an internal temp of 165. I often link up to these parties. What a great idea Julie! I love caprese salad and never thought of a roll-up! This would make for an easy week dinner. Thanks for sharing! You’re welcome, Zainab! These were so much fun to make! This is my second caprese dish I’ve seen today so I am surely in heaven! It is my very favorite and this looks incredibly delicious! 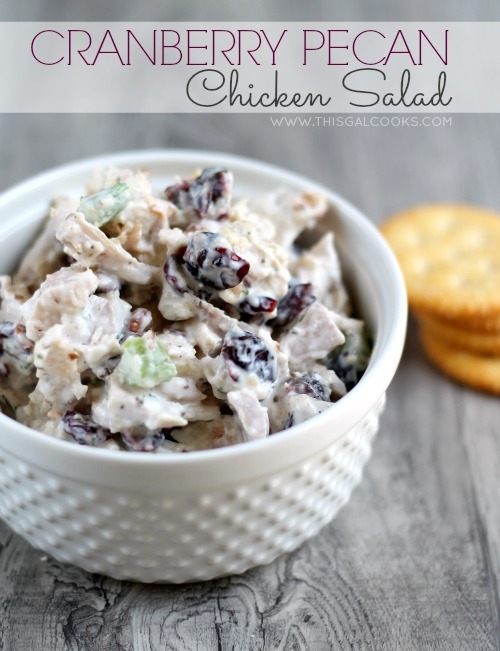 Thanks for sharing the recipe, Julie – pinning! Have a great July 4th! Was the other one Carrie’s? When I saw hers this morning, I was like “Oh snap, great minds think alike!” Thank you so much for stopping by, Cindy! ok so i’ve never heard of a caprese anything but this looks awesome and it’s chicken! i’m going to have to bribe older teen into making it. thanks so much. 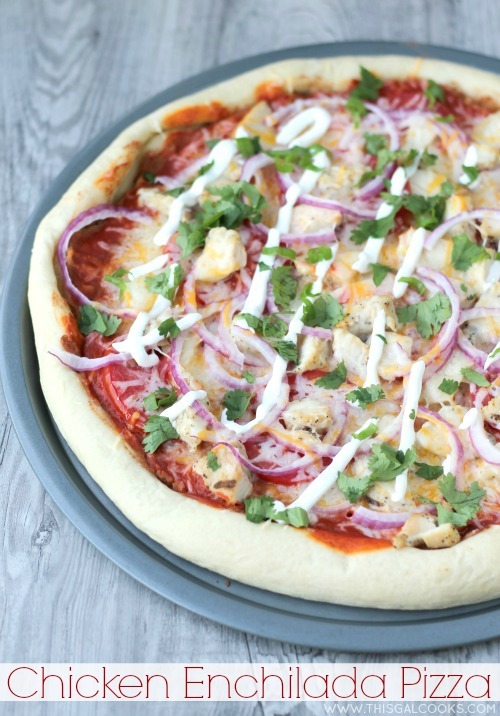 This looks so delicious and not too difficult! I love visiting your site because the pictures are so beautiful… but you always make me hungry! Thank you so much, Jenifer! I hope you have a fabulous weekend! yum i love anything with mozzarella! Me too, although, due to recently cutting dairy out of my diet, I can’t really eat it anymore. Ah well, it’s all good! Thanks for stopping by! These sound really tasty and easy, Julie! Pinned! Thank you, Andi! Hope you had a wonderful 4th! Met you through Best of the Weekend. This is a gorgeous recipe! I don’t eat chicken all that often, but I can definitely see myself trying this. Thanks for the inspiration. You’re very welcome, Camilla! Thank you so much for stopping by! Have a wonderful weekend! I love this idea, even with the cheese :) It looks delicious! Hi! I’m stopping by from Tasty Tuesdays. Your Caprese Chicken Roll Ups look delicious! They will definitely be on my menu soon! Thanks for sharing!